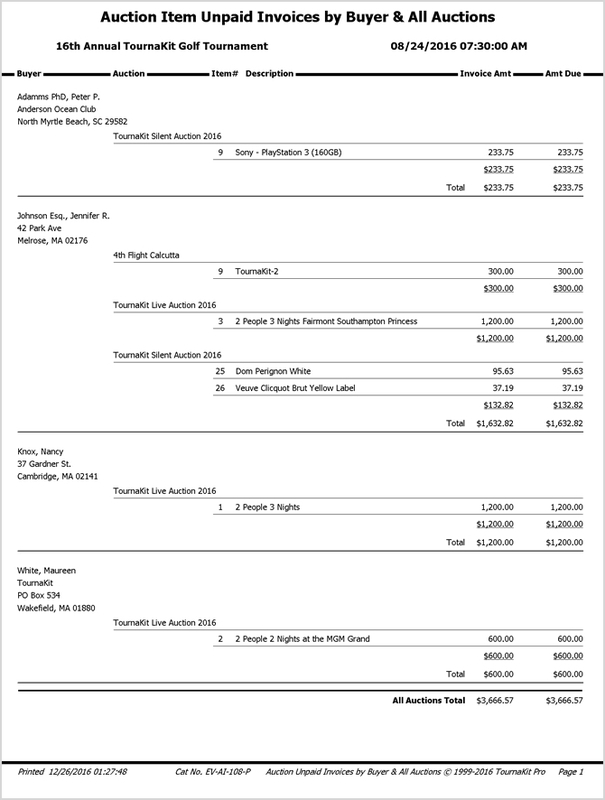 TournaKit Pro answers 'How to run a charity auction' from start to finish, fast and professionally from your desktop/laptop. 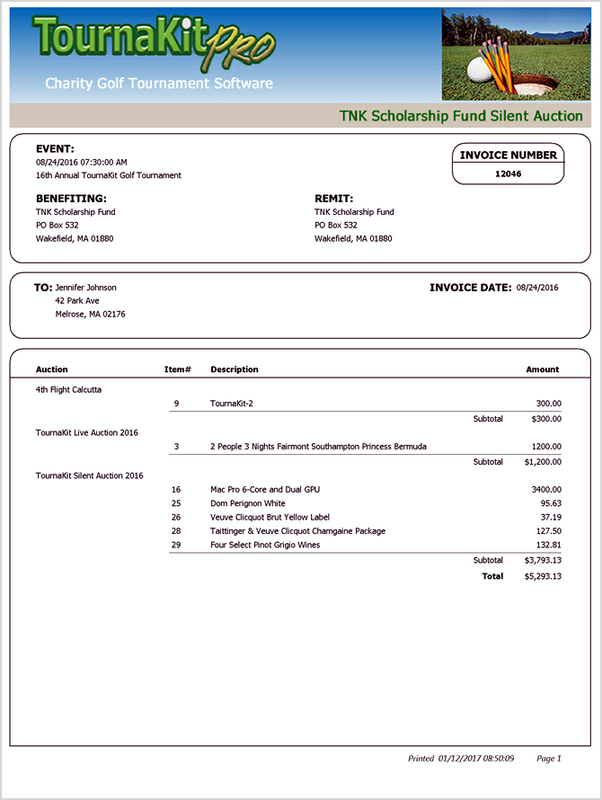 Install TournaKit Pro on your computer and you will have everything needed to handle all aspects of your live or silent auction(s) fully integrated within your charity event i.e. golf tournament. Over 400 Auction Templates - You don't have to be an expert graphics designer to get professional looking results, TournaKit Pro will do the work. 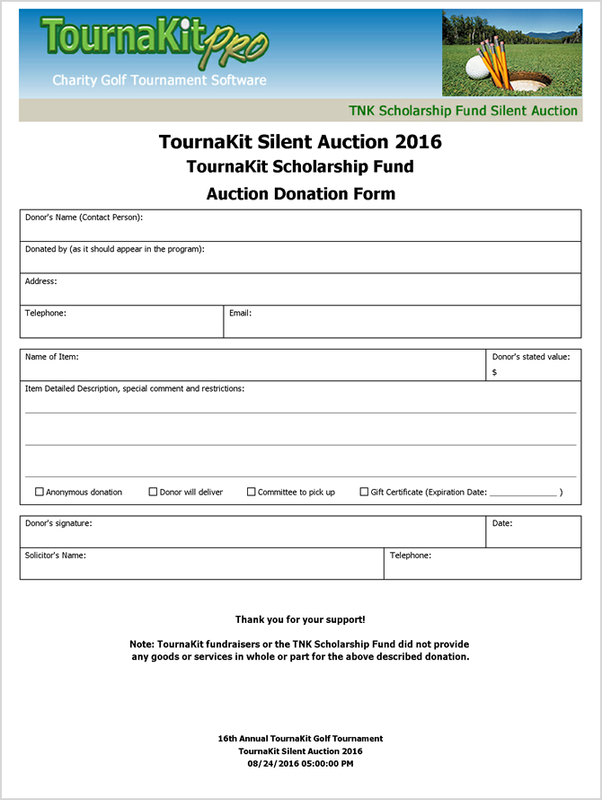 TournaKit Pro's integrated live and silent charity auction software has evolved over decades. You get comprehensive charity auction software that provides guidance through structure and proven systems for growing a charity event from the ground up. Impress your guests and yourself with what you can do and it is so easy! You will be able to produce cover sheets, silent auction bid sheets, invoices and receipts with 'The Look' as if created by a professional graphic designer. 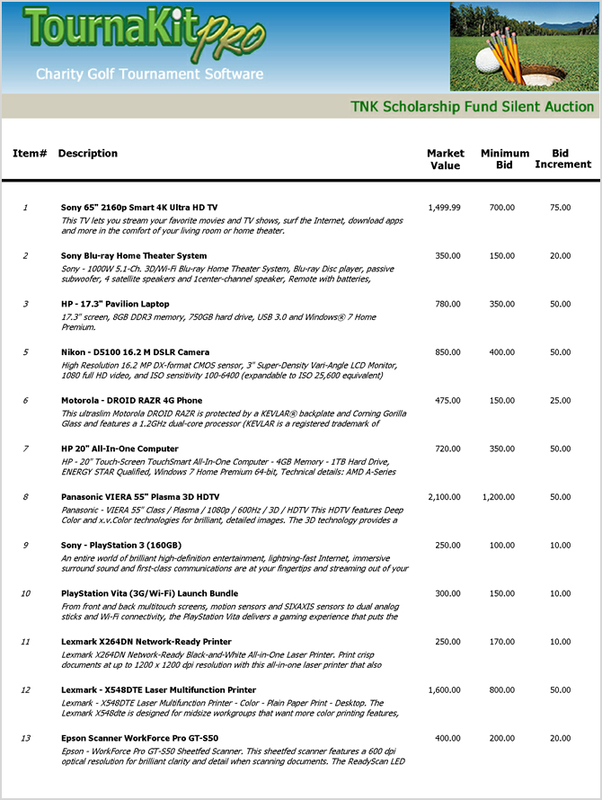 With over a 100 silent auction bid sheet template variations. 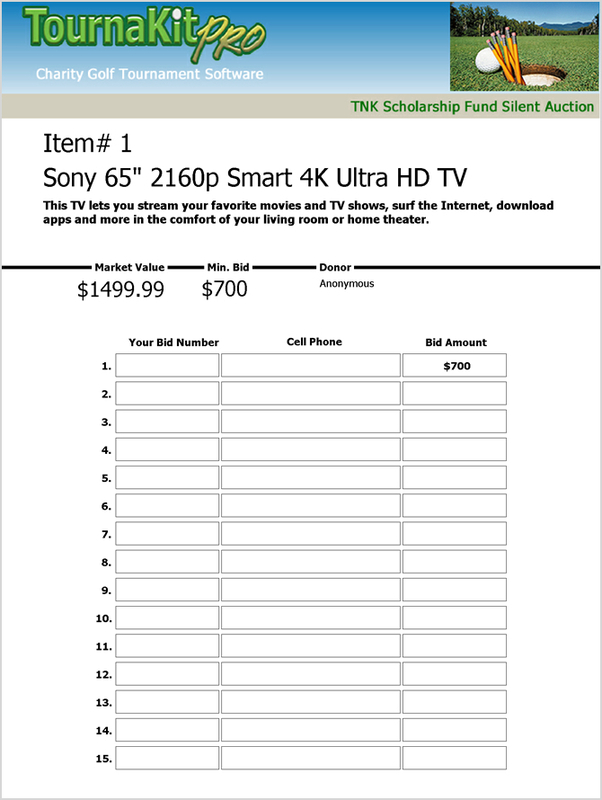 One of the more popular silent auction bid sheet formats requires bidders to use preassigned bid numbers instead of their name and the silent auction bid sheets start with a minimum bid amount. 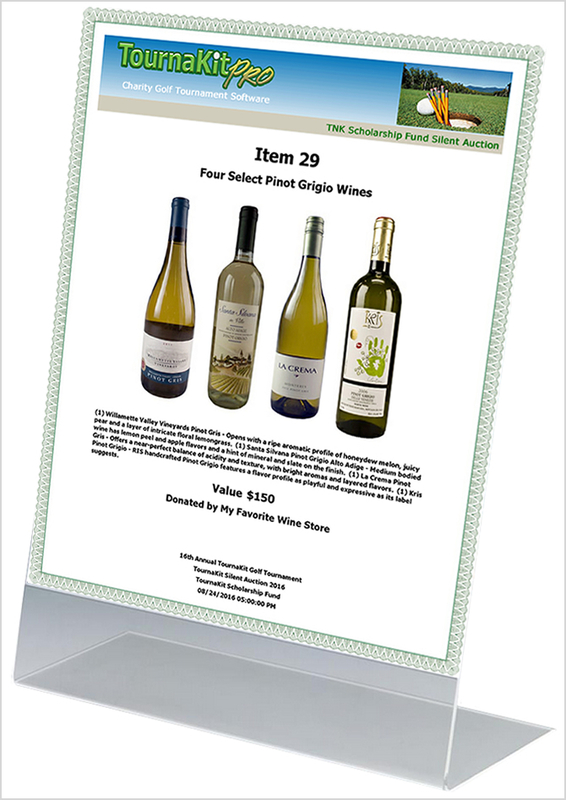 Go to 'Auction Images - Silent Auction Bid Sheet Templates' for more silent auction bid sheet examples. Closing out single or multiple auctions is simple. 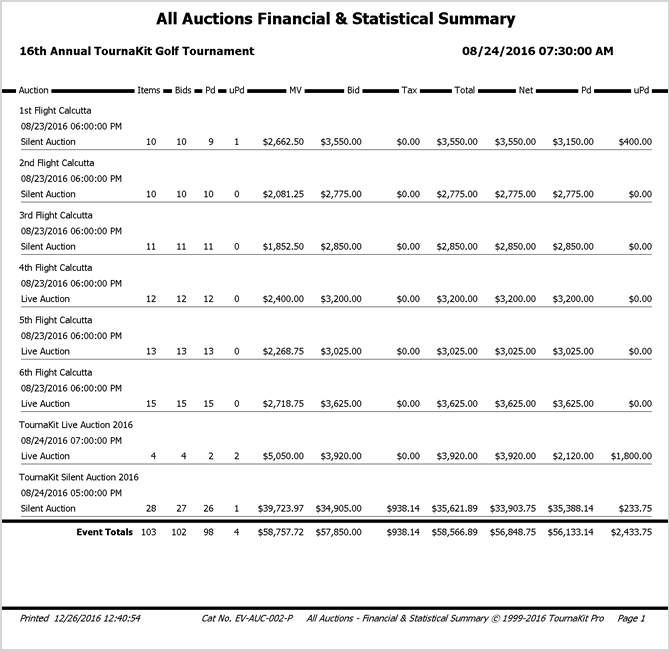 Your auction buyer wants an invoice. 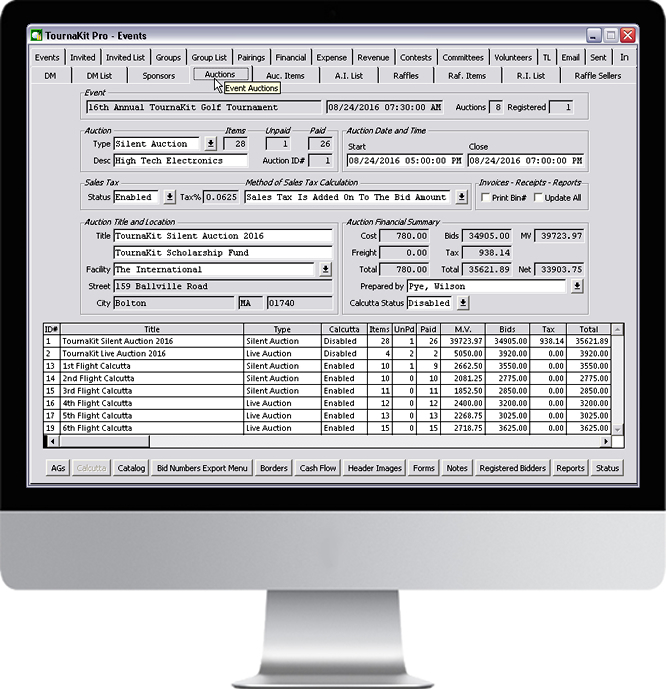 With a click, TournaKit Pro will quickly produce a line item invoice for ALL your auctions. 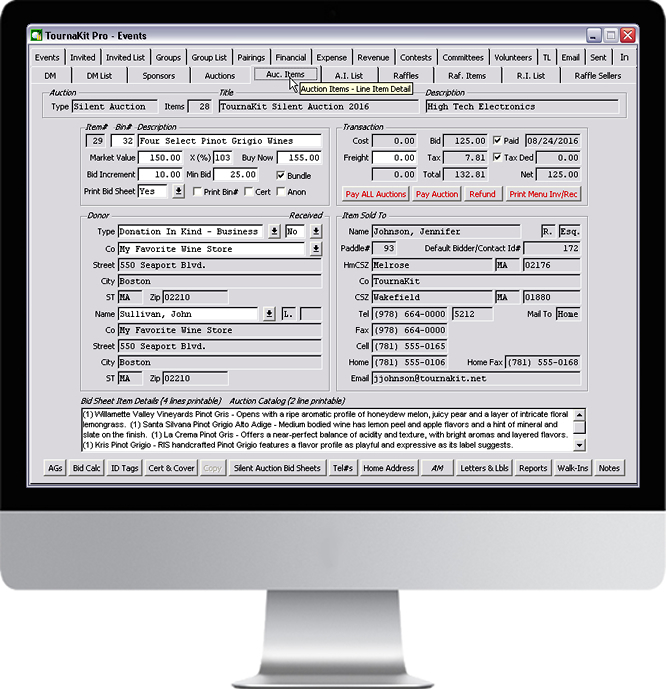 TournaKit Pro makes it possible to pay for auction items from multiple auctions and generate an instant line item receipt (market value optional). Create your very own styled gift certificate with 14 auction item gift certificate templates to choose from. 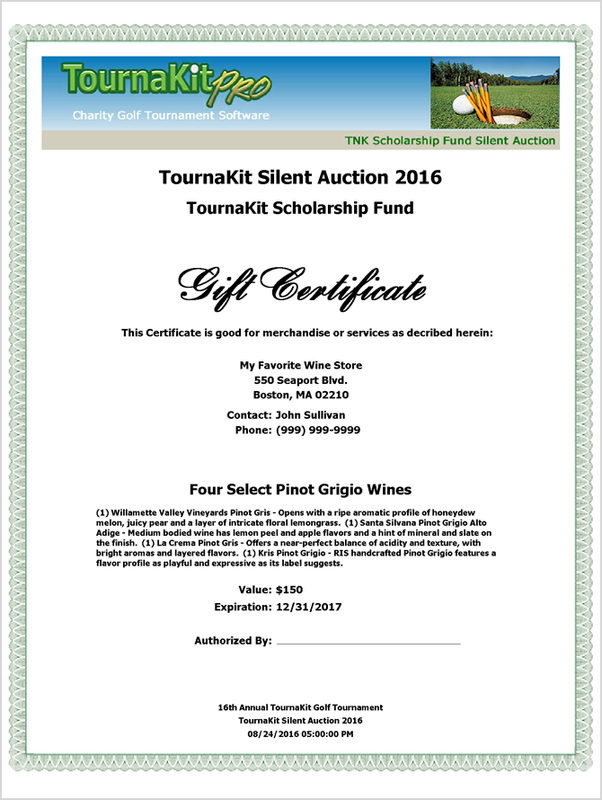 Available in both portrait and landscape formats you can add your organization's logo and border to personalize your own auction item gift certificate. 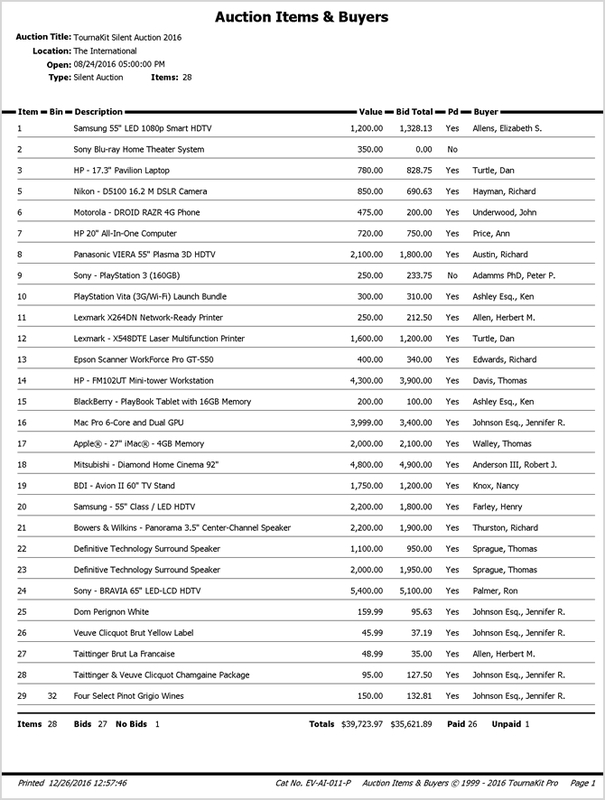 In a matter of minutes produced your auction(s) item catalog and group e-mail out a PDF version to everyone in your TournaKit Pro Contact directory. Of course you can print and distribute your auction catalog by mail or have readily available for the day of your event. You have 56 Auction Donation Form templates to choose from. Make it easier on yourself to create complete and descriptive auction item records with help from the auction item donor. 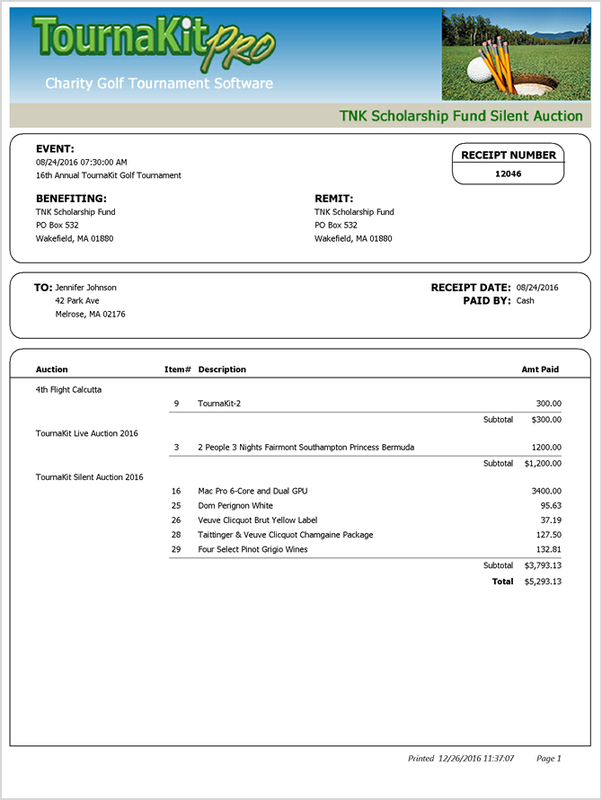 A completed auction donation form will provide current donor contact information, a market value estimate, and good auction item description that can be used to produce essential documents most especially the silent auction bid sheet. Everyone Wants To Know Who Bought What? It's Over Before You Know It!